Just by the title alone I’m sure it provoked some kind of feeling in you. At least in my social circle, Yahtzee either brings out the best in someone or the worst. You either love it or you hate it. Guess which side of the fence I’m on? That’s right…I love it! The dice don’t always agree with me, and for the most part I just do an average job at playing this game. However, I still like rolling for different combinations, and of course I love it when I get the beloved Yahtzee (five dice all in the same number within three rolls). I recently thought about having my oldest son play. He’s only six, but he’s able to comprehend what to do and he’s good at math, etc. When I asked if he’d like to try he was so enthusiastic about it! I’m so happy he likes playing games! Let’s just say I would soon regret that, lol! No, I actually don’t regret it, but boy does this kid play WELL!! I know no one can really determine how the dice are going to cooperate, but these dice really like him. And I mean, really like him! The first few games we played he got one Yahtzee in each game! 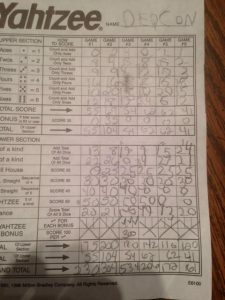 This picture is quite blurry, but look at the score on the third game of this sheet! 534 whopping points because he got FOUR Yahtzees!!! Yes, I said FOUR in ONE game!! Who does that?!??!?! Since that one game the dice have become a little more fair, but he still beats me almost every time. Regardless of that, though, it is so nice to have someone else to play with who loves this game. I do have an aunt that will play with me on occasion, but most of the time I’m left playing by myself! Not anymore!!!!! (Insert joyous dancing here) LOL! What games do you enjoy playing? I really want to start doing a family game night once a week or something so I’m looking for options!